Savory, easy-to-make Veggie-Loaded Slow Cooker Turkey Chili that’s perfect for a healthy and gluten free weeknight dinner. Make a big batch of this recipe and have it throughout the week! This isn’t your typical slow cooker turkey chili. This is VEGGIE-LOADED turkey chili, y’all! Because when you’re not crazy about veggies but you love the way that you feel when you eat healthy, sneaking veggies into your everyday meals is a total must. This recipe includes tons of veggies, is comfort food heaven, and perfect for a chilly winter day (errr any day, really)! Throw the raw ground turkey straight into the slow cooker along with the other ingredients to make this slow cooker turkey chili! I used raw veggies chopped up into very small pieces for this recipe. However, feel free to use frozen or canned veggies if that’s easier for you! Some of my faves: these organic canned carrots, canned zucchini, and gluten free cream of mushroom! This Slow Cooker Turkey Chili recipe is great for batch cooking! This recipe has around 8 servings (about 1.5 – 2 cups each), but feel free to double the recipe and refrigerate or freeze the leftovers. Perfect for quick and easy healthy meals all week long! I love making this recipe in my favorite slow cooker because it’s big enough to hold A LOT of chili. 😉 I also love that it’s programmable. Check it out HERE! 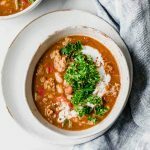 Savory, easy-to-make Veggie-Loaded Slow Cooker Turkey Chili that's perfect for a healthy and gluten free weeknight dinner. Make a big batch of this recipe and have it throughout the week! Place the ground turkey, chopped carrots, and chopped zucchini into the slow cooker. Set the slow cooker on high for 3 hours. Half way through (after about 1.5 hours), add in the remaining ingredients. Cook until everything is soft and the turkey is fully cooked. -If using canned vegetables, cook the turkey for the first half (1.5 hours) and then add the veggies in with the remaining ingredients. -Feel free to play around with adding more or different veggies in this slow cooker turkey chili recipe! Making this today! Is there a dairy-free substitute that you would recommend for the cream of mushroom soup?